isn't that the "eat quiznos subs mice?" This has got to be the biggest inside joke ever....I hope. this tattoo is like stuff I draw. It is supposed to look like this. Poster of this picture: FAIL. Tattoo: WIN. WIN! this should be in "passed out pics"
The tattoo is a fail mate stuff that .... he's life's a fail. That whole tattoo is a fail! 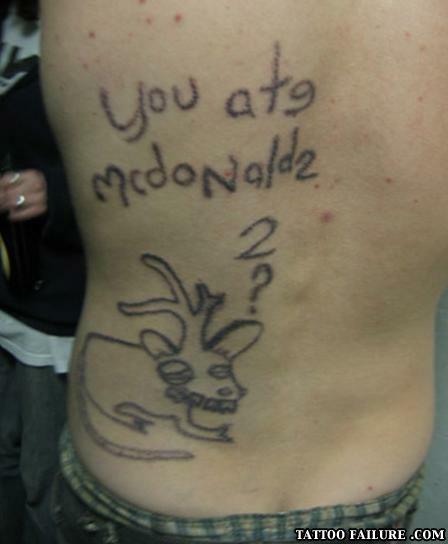 i think it says You ate mcdonaldz and a weird Raindear / mouse thing? I know the answer to that vile beast's question! it's 42, of course! And that's exactly why i don't eat at McDonald's! What do you mean, you found THE fail? so you seriously think the fail is the backwards letters? omg, noone does letters backwards by accident, above the questionmark... the 2 is also supposed to be a question mark. its not easily spotted as the top part of the 2 is right, eccept its meant to be a question mark. That is a WIN! It's too funny. If you don't get it I'm sorry. Why was the boy sad?